The Secretary of the Gram Panchayath at Shivanahalli met us and explained to us the difficulties he was facing in the Panchayath because of his honesty…It is indeed a tragedy that we have managed to keep the honest people in the Governance system subdued or suffocated. They hardly seem to have the space or the incentive to continue to be honest. What we need is to steadily overwhelm the Governance system with goodness and good people. We need to create a mechanism and a platform for the honest to express themselves. Can we think of a web portal for this? We walked into the town of Kanakapura, where the reception was very good. But we were stuck in a major traffic jam caused by a political event happening there. After losing much time and patience, we managed to reach the bus stand and sang a few patriotic songs there. Mr.Shivakumar, a donor and a long-time friend of SVYM joined us with 15 of his friends here. Shivakumar’s coming was again a God send. The uncertainty of not having a place to stay and food to eat for the next 4-5 days was resolved. He agreed to take care of all the logistics. These kind of occurrences are no longer mere coincidences. They are beyond the comprehension of a mortal mind. What more proof does one need to be convinced that we are guided and taken care of by a special force? Every time, we have a problem, there seems to manifest a person who resolves it easily. It looks as though Swami Vivekananda has a organized team of people to ensure that we complete our yaathre successfully. The more I experience all this, the more I am convinced that this yaathre will lead to something special and different. This will indeed become a milestone in the progress of Swami Vivekananda Youth Movement. The press meet , interaction with members of the Rotary and the public function at Kanakapura were well attended. Our team which went door to door also received an enthusiastic response from the people. The dinner, hosted by Dr.Ashok, was a gastronomic delight!! We are all getting comfortable to having minimal water and sanitation facilities at all the places that we are staying in. Looks like we will find anything more than this a luxury. How the mind can get conditioned to both ‘having’ and ‘not having’ too! Today was a long day and we walked close to 25 km, before reaching Harohalli. The dinner was hosted by Mr.Murali – a simple, tasteful meal, cooked and served with utmost affection by his family. We were joined by Prof.Venugopal (Venuji, for us), the former Academic Director at VILD. He conducted the program at Somanahalli and Hosadoddi in his own inimitable style. His infectious enthusiasm got our team very charged up! …There is so much of a difference between rural and urban areas. Not only are the geography and landscape different, but also the people and their attitudes. The heaps of plastic and trash are increasing as we get nearer to the city of Bangalore. So is the cynicism and apathy of the people. People are so evidently commercial. One person argued with us that we could not be undertaking this yaathre merely out of National interest. He felt that we must be having our own political or other financial interests in doing this. However we explained, he could not reconcile to accepting our perspective. Strange indeed are the ways of urban India! The stay at the Sharavathi school at Hosadoddi run by Mr.Shivakumar was indeed a luxury compared to what we had experienced in the past fortnight. Clean running water, toilets, a bathroom and delicious food increased the already high levels of energy of the team. After prayer, Venuji spoke about Bhagat Singh (today was his 101st birth anniversary) and he further heightened the feeling with his songs, dance and slogans. Mr.Abhay, a social activist from Raichur joined us and spoke about his experiences in dealing with NREGA and Social Audit. 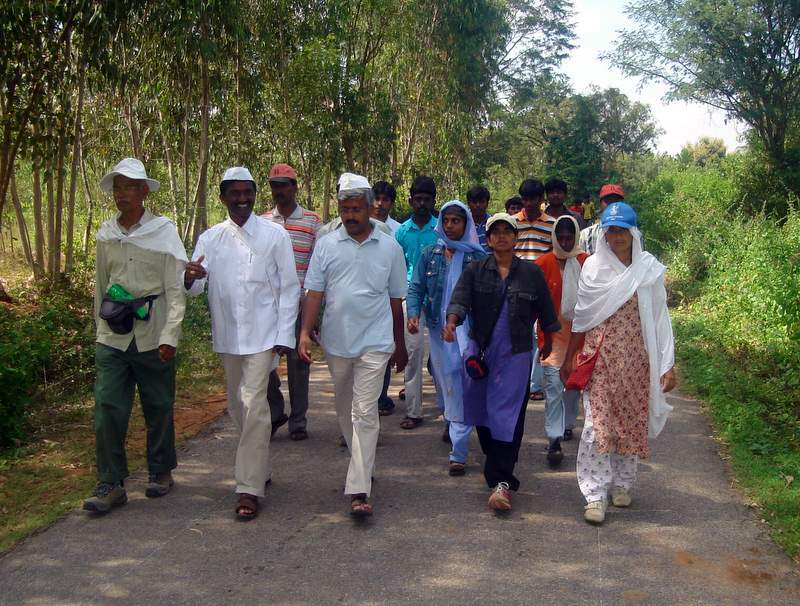 As of today, we have walked through more than 109 villages and spoken to nearly 175,000 people….RTI is not just a tool for development and good governance. It has the power and potential to transform the representative democracy which exists in India to true participatory democracy. Power that information can bring can make our citizenry included in the democratic, political and developmental processes in the rural areas. We need to sustain this campaign and make sure that people understand that the paradigm is not merely securing and processing information but the change that this Act can bring in enhancing their self esteem and self confidence.